This gorgeous eyeliner is from the Louise Gray collection by Topshop. Get the whole collection half price now at your nearest Topshop or there's some online. I picked this colour up because I loved how bright it was. I recently used this on New Years Eve when I did a navy smokey eyed look. The tip on this is amazing. I was able to get a clean and precise line, with a lovely bold colour. Another love of this product is the cute packaging. I love the gold diamonds and pastel peach colour, really stands out in my make up box!! 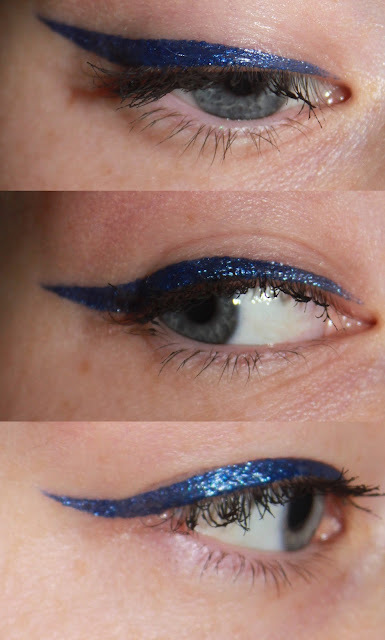 The eyeliner really is amazing though, doesn't budge at all on my oily eyelids. I tested it on my hand before buying it, and it took me some good scrubbing to get it off - But comes off a dream with a decent facial wipe. Overall I will be using this as much as I can, it's such a pretty little thing. I gave this a 9/10 for gorgeous colour, beautiful staying power, and it looks lovely in your make up box! This colour is really pretty but I wouldn't be brave enough to wear it!